I’ve written about restoring the ancient traditions of Saturnalia to this blessed time of year (Io, Saturnalia! ), but some people just have no sense of tradition. They just want me to put the Christ back in Christmas. Fine, I don’t want to cause offense by wishing anyone “Happy Holidays” when all they want is for me to validate their personal piety. So let’s get Christ into our celebrations. Just who is this Christ anyway? Christians say he’s a person named Jesus, and we can learn all about him in the Gospels. Sure enough, in the first chapter of the Gospel attributed to Matthew, we find a lengthy (17 verses!) section of begats tracing Jesus’ lineage back to the ur-patriarch, Abraham. In the third chapter of Luke’s Gospel, we find fifteen verses of a reverse genealogy tracing Jesus back to Adam, and ultimately, God. The two lists don’t match, and where they do, there’s a problem. You see, both cite Joseph as the father of Jesus. It’s Joseph’s only real appearance in Scripture, and it seems he’s just there for his lineage. But according to those same gospels, Joseph was just a poor schmuck who found himself with an unexpectedly pregnant girlfriend. When he confronted her, she told him that God was the baby daddy, and he apparently bought it. So neither genealogy can possibly be true or relevant. Matthew said that Jesus was born in Bethlehem when Herod was king. Because Herod was afraid the infant Jesus would overthrow him, Herod had all children under the age of two in Bethlehem killed. Now, Herod the Great was a nasty piece of work. He murdered his wife and two of his sons. But there is no record anywhere of a mass infanticide. Such things get reported and remembered. Luke didn’t mention Herod the Great or any slaughter of babies. But he absolutely pinpointed the date of Jesus’ birth. He said that Caesar Augustus had decreed a taxation census during the time when Cyrenius was governor of Syria, requiring everyone to return to their ancestral villages to be registered and taxed. Joseph’s ancestor, as noted in the next chapter, was David, so he had to pack up his pregnant fiancee and travel all the way down to Bethlehem. Just one problem. Caesar Augustus never made such a decree. The Romans kept excellent records, and there’s no mention of a general census during this time period. And even if there were, the idea that Rome or any other empire would require people to return to a village of an ancestor who’d been dead for almost a thousand years is absurd on its face. It never happened. Worse, we know from Roman records exactly when Cyrenius was made governor of Syria. After his death in 4 B.C., Herod the Great’s kingdom was divided between three of his sons, Herod Archelaus, Herod Antipas and Philip, according to his will and per order of Caesar Augustus. Augustus found Archelaus incompetent and banished him in 6 A.D., appointing Cyrenius in his place. Why do the Gospel writers go so far out of his way to create a narrative that would cause Jesus to be born in Bethlehem rather than Nazareth, where Joseph was from? Perhaps it was to fulfill what was thought to be a prophecy by the Hebrew prophet Micah: Micah 5:2. But Matthew deliberately misquoted the verse and took it out of context. Matthew’s version: “And thou Bethlehem, in the land of Juda, art not the least among the princes of Juda: for out of thee shall come a Governor, that shall rule my people Israel.” But Micah 5:2 refers to Bethlehem Ephratah, a small Hebrew clan descended from Bethlehem, son of Caleb’s second wife, Ephratah. It had nothing to do with a town. And if you read further, you see that this descendant of the Bethlehem clan would be a military leader who would defeat the Assyrians. The Assyrians were extinct by 612 B.C. And the whole ornate story about Mary being a virgin? Not only was it pretty common coin in Middle Eastern religions for a god to be born of a virgin, but it’s also based on a mistranslation of Hebrew Scripture, Isaiah 7:14, “Therefore the Lord himself shall give you a sign; Behold, a virgin shall conceive, and bear a son, and shall call his name Immanuel.” The version of Hebrew Scriptures available in the first century was the Septuagint, translated by Greek scholars in 3 B.C. The Greeks translated the word “almah” as “virgin” rather than “young woman of childbearing age.” (Hebrew had word for virgin, “bethulah.”) And as in the Micah prophecy, if you read the context you find this prediction to King Ahaz concerned immediate circumstances, not a messiah in the distant future. So, to sum up, Jesus was born (certainly not in December) of a young woman before 4 B.C. and after 6 A.D. in the town of Bethlehem to fulfill the prophecy of an Assyrian-conquering descendent of Bethlehem the man, to which his parents had traveled by order of a non-existent census decree by Caesar Augustus, and whence they fled to escape a mass infanticide ordered by a mad king that almost certainly never happened. Got all that? And that’s the reason for the season. Merry Christmyth! I had not caught the date discrepancies. You bet. It's a nice piece, pulls in lots of different angles on the story to make it very clear how mythological it is. Not that it will make any difference to some bible thumpers, but open minded folks will perhaps begin to notice myth when it is presented as fact. 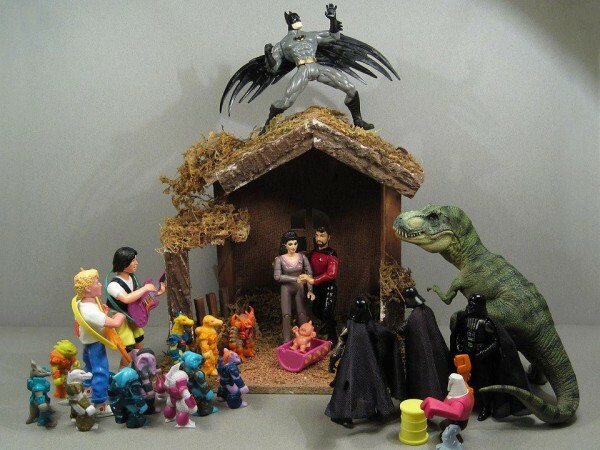 That's the best nativity scene I have ever seen. Of course I am partial to Star Trek and Marvel Comics!